Maybe lunar? That’s what the field team thinks. It’s all educated guesses until the rocks get back to the NASA Johnson Space Center where they’ll be characterized and made available for study. In the background someone (Brian Hynek?) is drilling a hole for the flag with a battery-powered drill. For dense morainal searching, it is quick, cleaner (not many chips flying around) and less likely to get damaged on a rock than our traditional ice chisel. Another good day of meteorite recovery at Davis-Ward. We started off this morning driving head on into fairly strong winds and a temperature of -6 F. By lunch time the wind had almost stopped completely and not a cloud could be seen in the sky. Today we systematically searched the smaller of the two ice tongues, along the edge of Mt. Ward. Only two more Skidoo sweeps to finish it entirely. 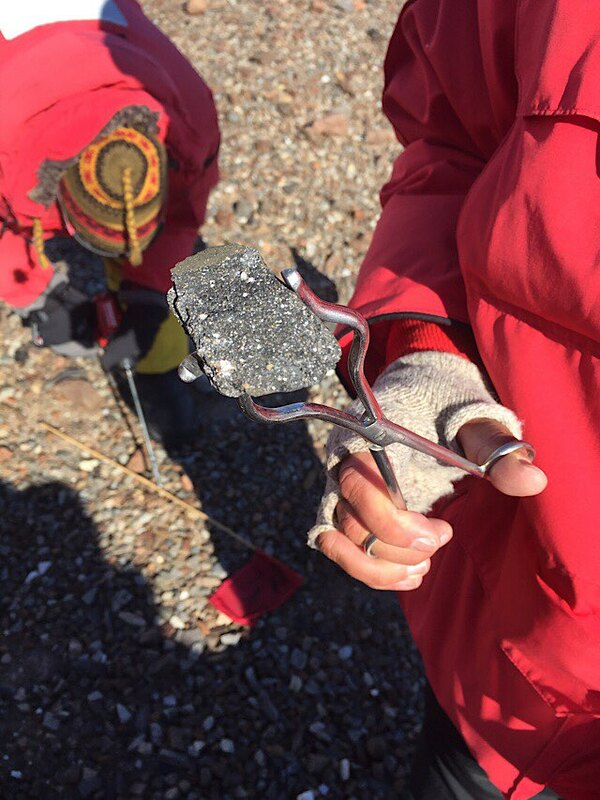 In all we collected 33 meteorites today, bringing us close to 700 for the entire season. The ice tongue is just about a mile in width, and the whole area is just littered in terrestrial rock. This has been making our sweeps very long and intensive. Our search technique is to line up on our Skidoos, about 20 yards apart, and slowly progress forward as one unit. (Or at least that’s what we initially attempt to do). About every 30 yards or so we climb off our Skidoos and foot search the next 30 in front of us. It can become quite a tedious task, but it’s the only way to confidently search a large area with so much terrestrial rock on the surface. If all goes to plan, this may be our last full week in the field. Time has really been flying! John McBrine, Brian Hynek and I have been here for 33 days today.